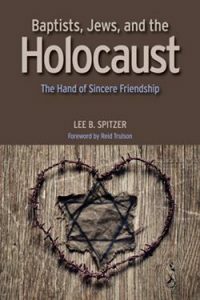 Review of Lee B. Spitzer, Baptists, Jews, and the Holocaust: The Hand of Sincere Friendship (Valley Forge, PA: Judson Press, 2017). Pg. xiv + 482. ISBN: 9780817017828. Lee B. Spitzer, General Secretary of American Baptist Churches, USA, has written a comprehensive study of the relationship between Baptists, Jews, and the Holocaust. Long curious about Baptist attitudes and responses during that time on account of his own secular Jewish background and his relatives’ reluctance to discuss their Holocaust experiences, Spitzer traces Northern, Southern, and African American Baptist engagement with both US and European Jews, the latter under threat of annihilation by Hitler’s Nazi regime. The book’s subtitle comes from a 1935 London speech by Dr. J.H. Rushbrooke, President of the Baptist World Alliance, in which he reaffirmed a declaration against racial persecution issued by the 1934 Baptist World Congress in Berlin. Quoting the declaration’s condemnation of “the placing of a stamp of inferiority upon an entire race” and “every form of oppression or unfair discrimination towards the Jew” as “a violation of God the Heavenly Father,” Rushbrooke lamented the suffering of European Jews. “To my Jewish brothers and sisters under such conditions I extend the hand of sincere friendship,” he avowed (3). Despite the initial impression that the author’s ecclesiastical position and the book’s subtitle might suggest, Baptists, Jews, and the Holocaust is no simple glorification of Baptist-Jewish history. Rather, it is a thoroughly researched analysis of diverse Baptist responses to the plight of Jews during the Nazi era. Spitzer’s sources include a wide array of archival material: annual convention or conference books of Northern, Southern, Swedish, Regular, African American, and Seventh Day Baptists; minutes and correspondence from the Baptist World Alliance; papers from various Baptist boards, societies, and personnel; and several dozen national and regional Baptist periodicals. This is complemented by three main Jewish sources—The Jewish Chronicle, The American Hebrew, and The American Jewish Yearbook—and a solid collection of relevant secondary sources. Surveying the existing accounts of scholars like William E. Nawyn, E. Earl Joiner, and Robert W. Ross, Spitzer finds only brief, negative assessments of the two large, national, and white Baptist conventions. Omitted are the African American and the regional, state, and local facets of the history. Convinced of the need for a fresh assessment, the author begins by considering historic Baptist commitments to both democracy and religious toleration, then turning to Baptist-Jewish encounters during times of Jewish immigration in the late nineteenth and early twentieth centuries. Here we find fears of immigrant criminality from “this European sewer” but also compassion for “God’s own people” (22, 24). This background is useful, because it contextualizes the unruly mixture of Baptist concerns and responses to Jews later, in the 1930s and 1940s. Statements like these simultaneously asserted racial difference—even hierarchy—affirmed a Baptist commitment to the primacy of Christianity, and expressed a desire to live in peace and harmony with other peoples. As for Southern Baptists, already in the nineteenth century they “recognized the role of the Jews as the Old Testament people of God, acknowledged a missionary call toward them, demonstrated ambivalence toward the restoration of Israel as a nation, and imagined a responsibility for mission work among Arabs as well” (55). Like their northern counterparts, Southern Baptists expressed fear that the immigration of “Roman Catholics, Jews and heathen,” who were “enemies of the evangelical faith,” would flood American cities and threaten both American and Christian institutions (59). More surprisingly, Southern Baptists called for an international conference in 1919 to alleviate Jewish suffering and emphasized a core Baptist commitment to religious liberty (60-61). With respect to the Nazi era, Spitzer asks three questions that form the basis of his study: “was the Baptist offer of friendship to Jews really sincere? Did Baptists throughout the United States reach out to Nazi victims through individual and corporate expressions of caring and compassion? Were Baptists in the United States truly concerned, or were they apathetic in the face of the persecution and attempted extermination of the Jewish people?” (5). He formulates his answers in sections covering Baptist periodicals and then Northern, Southern, and African American Baptists, each in their turn, before turning to the Baptist World Alliance towards the end of the book. As Spitzer examines reports and editorials on the plight of the European Jews, he expands on Robert W. Ross’ research on the Protestant church press by scrutinizing a wide variety of Baptist publications, most importantly Missions and The Watchman-Examiner. The latter reported extensively on Nazi antisemitic campaigns, Jewish emigration, attacks on eastern European Jews, deportations, camps, and the scale of the killing in the Holocaust. Also important were the editors’ interest in Zionism and Jewish migration to Palestine (in light of biblical eschatology) and numerous condemnations of Nazism and antisemitism (139). Complementing this examination of the Baptist church press was a chapter on The American Hebrew, which covered the 1934 Baptist World Congress, considered Christian-Jewish relations, and praised Baptist and other Protestant expressions of sympathy, only growing more critical after 1943, when it censured both Christian antisemitism and Baptist suggestions that Jews convert (135). Having concluded that Baptists were well-informed about Jewish suffering, Spitzer moves into the heart of his study, seeking to determine whether Baptists responded to the Holocaust and, if so, how. He finds that Northern Baptists, who were used to addressing domestic and international social and political issues, repeatedly issued national statements condemning Nazism and sympathizing with persecuted Jews. In 1939, for instance, the Committee on Race Relations denounced American antisemitism, while the Resolutions Committee affirmed that “God hath made of one blood every nation of men to dwell on all the face of the earth, and that we are His offspring” (152). The committee then condemned prejudice against African Americans, Asian Americans, and Jews. Various regional and state assemblies did likewise, though none of these sentiments were translated into personal, practical aid. Spitzer explains how Southern Baptists criticized the Nazi regime primarily for its attempt to overthrow “all the things for which men have fought, bled and died for” since the time Christ preached the Sermon on the Mount, namely the “idea of the worth and dignity of the individual, which is the basis of democracy” (277). Still, Southern Baptists did support the racism resolution at the 1934 Baptist World Congress, as well as its reiteration in 1939. At the state level, apart from Missouri, Southern Baptist Conventions did not express sympathy for persecuted Jews until after the Kristallnacht Pogrom of November 1938. Then, however, six state conventions were outspoken in their denunciations of Nazism and their support for Jews, and two others expressed some sympathy (303-324). Overall, though, the author concludes that Southern Baptists were more concerned to convert Jews than to work for justice for them (343). … we confess that our sympathy is mixed with sadness, fear and suspicion. We wonder if when the Czech and the Pole and the Jew, of all nations, eventually achieve freedom from fear, they will join the rest of the white world in appropriating and reserving for themselves this freedom for which black men, too, have fought, bled and died? Freedom for all men, everywhere, is the only thing worth fighting for (363-364). Internationally, Spitzer argues, the responses of the Baptist World Alliance to the Nazi persecution and murder of Jews were an amalgam of all of these diverse Baptist perspectives. “While passing resolutions that voiced Baptist opposition to Nazism, the persecution of Jews, and anti-Semitism, the BWA never developed a strategy for assisting Jewish victims of Nazism or resettling Jewish exiles in the aftermath of the Holocaust” (441). In the end, Spitzer’s analysis uncovers the good, the bad, and the ugly about Baptist responses to the Holocaust. Writing for his coreligionists, he concludes that “the hand of sincere friendship” was not really offered by Baptists towards Jews. He makes the appropriate judgment that “Baptists felt solidarity with Jews because of their status as a persecuted minority and not because they were involved in caring relationships with Jewish neighbors. … Baptist recognition of Jewish victimhood did not compel comprehensive, concerted, or practical action on their behalf, which friends might expect from friends” (455). We can only hope, with the author, that his thorough analysis of this history bears fruit in contemporary Baptist and wider Christian responses to antisemitism in the twenty-first century.